We have a brand new book for Flash and ActionScript developers who want to make iOS apps with with Swift, called Migrating to Swift from Flash and ActionScript. You can get the electronic edition (Kindle, PDF, EPUB) from Amazon or Apress or you can pre-order the print edition, which is coming out on November 13th 2016. You can also download a free sample here..
Not quite yet. And neither are your Flash and ActionScript skills. But we can all feel the wind of change that Swift – Apple’s latest programming language – is bringing. This might be sad news for Flash, but not for Flash developers. Moving on to native development for iOS is much easier than in the Objective-C days. And your Flash and ActionScript experience has already won you half the battle: instead of starting from scratch, you will find that you are already familiar with a lot of Swift syntax and concepts. At DiaDraw we specialise in building bridges between technologies with native extensions, tutorials, books… So there is a need to adopt new programming languages quite often and quite quickly. There are typically three levels of migration when you move on to a new technology: tools, language and workflow. 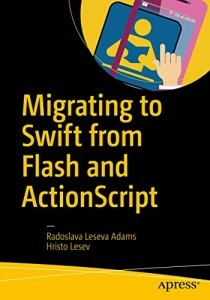 Migrating to Swift from Flash and ActionScript walks you through all three with illustrated tutorials and as little dry theory as possible. If you have developed AIR apps for iOS, you know that making the app is about half the work you need to do before you can even run it on a test device. We make sure that you are all set up with the tools that you need, in order to write and run your first line of Swift code: downloading and configuring Xcode to work with your Apple account, provisioning (*) your test devices and making sure that you can run and debug your apps on them. (*) Apple speak for ‘enabling and authorising’. Swift does look a lot like ActionScript when you first start, but what’s with all those questions and exclamation marks, are protocols the same as interfaces and how is this a closure?! 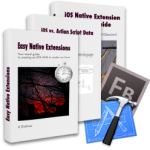 We help you hit the ground running by outlining the knowledge that you can transfer directly from ActionScript and only spend in-depth time on concepts that are new or different in Swift. How many times have you found yourself with a new programming language book at hand, toolchain configured and test machine at the ready, wondering about the most efficient way to design the UI of an app, write concurrent code or debug your creation? This part of the book makes sure that you have these bases covered too. As a bonus, we have included 16 cookbook-style tutorials for dealing with popular situations like social network integration and messaging, taking advantage of device capabilities, networking and working with local and iCloud data, advertising in your app or game, and working with 2D and 3D graphics. And, because we know you ultimately want to sell your apps, the book also includes a final chapter that takes you through Apple’s App Store submission process. See, we really don’t want you to have to look for help outside this book when you transition to Swift! If you find any bugs or outdated code, let us know! We will give you a shout out on the errata page. We would like to dedicate this book to our dad, Iliyan Lesev, who first sparked our interest in computers and programming. Sadly, he passed away a month before the book was out and couldn’t see its final version. We love him and are grateful for his example and inspiration. Amazon: USA, UK, Germany, France, etc.